Reporting:Automate the pulling of data from multiple tools to create customized dashboards that enable agencies and their clients to monitor performance throughout the month, catch issues quickly and capitalize on positive trends. Sales Process: Use re-useable report templates to quickly provide prospective clients with a comprehensive report on their current performance. Retention/ Upselling: Use Databox's advanced features like Goals, Alerts, Scorecards, Data Calculations and Custom Metrics to ensure and prove the ROI they are delivering, as well as identify opportunities to provide even more value. Let's dive deeper into each of these use cases. 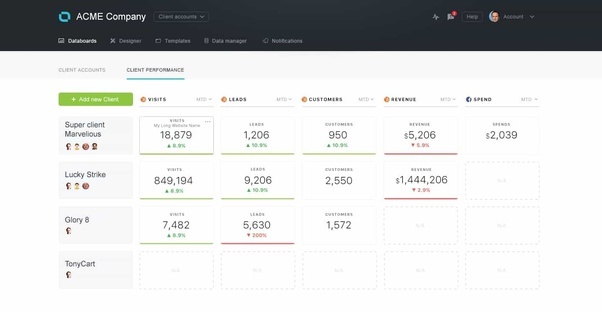 The Owner or Director of Client Services can use the Client Performance Screen to see up to 5 KPIs from every account on one screen. This allows you to perform quick health checks across all of your Clients. So, if you want to view your monthly Visits, Inbound Leads, New Customers, Revenue and Facebook Spend for every client, you can easily check in on that data every day in one place. For an individual Account Manager, the goal is typically to eliminate the hours of copying and pasting data into a spreadsheet and formatting a Powerpoint. This can be done by following the Onboarding plan for Databox Partners ( see here). In Databox, the automated dashboards refresh their data every hour in paid Accounts (or every day in Free Accounts), so the data is always current. This allows more time for analysis and actionable items based on the state of the data. Streaming URL that the Client can use to view their data on a TV in their office and/ or during monthly meetings with the Account Manager. Learn more here. Scheduled Snapshots that will send a screenshot of the Databoard at regularly scheduled times. Learn more here. Alerts set within the app. Learn more here. Daily scorecards sent via email. Learn more here. The main reason a Client hires a Marketing Agency is to improve their business. Therefore, the more specific you can get in diagnosing issues and improvement opportunities, the better. In Databox, you can create Databoards for perspective Clients to use during the Sales process. Once you create standard Templates for these Databoards, you can tag them Databoards to use with future prospects. Annotations and Notes allow you to highlight areas they could improve their performance so that your Sales pitch is based on fact, rather than assumptions. Don't have access to your prospect's Data Sources? Follow these steps to report on their data. Ultimately, the reason for reporting is to prove your Agency's value to your Clients. One way to do this is by setting clear Goals with your clients to ensure you are working towards the same thing. To figure out what this "golden number" is, you can ask your clients "what are you looking for from this engagement? Would you fire us for 10 Leads a month or 100 Leads a month?" (Here is advice on setting goals with clients from 36 agencies.) You can then add those Goals directly into the Client's Databox Account to ensure you're on track to reach them. The stricter you are with your Databox usage, the easier it will be to prove the correlation between your Agency's work and the Client's results. Annotations allow you to highlight significant activities that took place on your side, and the impact of that activity on your Client's business. For example, let's say you released a blog post for your client on August 27th that increased the number of Sessions from social media by 6% for the next 4 days. By adding an Annotation to a Line Chart explaining the reason behind the spike in Social Media Sessions after August 27th, you are giving your Client the tools they need to recognize the value of the work you're doing. This may also lead to conversations about how you can do more - if they're looking for a steady 10% increase in Organic Traffic, how many blog posts would you need to release a month to get there? With the proper setup and tools, this can all be identified through data. Further, Databox can be used to introduce entirely new services. With 75+ integrations, we can help you to introduce more robust SEO services, social media services, paid search or social, video marketing, outbound prospecting or customer service consulting, to name a few. Need more ideas? Here are the top Databox features that Agencies love.